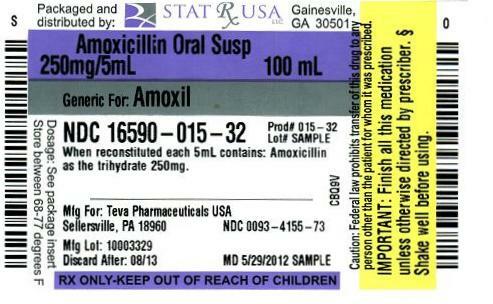 To reduce the development of drug-resistant bacteria and maintain the effectiveness of amoxicillin capsules, amoxicillin for oral suspension, amoxicillin tablets (chewable) and other antibacterial drugs, amoxicillin capsules, amoxicillin for oral suspension, amoxicillin tablets (chewable) should be used only to treat infections that are proven or strongly suspected to be caused by bacteria. Amoxicillin, in combination with lansoprazole delayed-release capsules as dual therapy, is indicated for the treatment of patients with H. pylori infection and duodenal ulcer disease (active or 1 year history of a duodenal ulcer) who are either allergic orintolerant to clarithromycin or in whom resistance to clarithromycin is known or suspected. (See the clarithromycin package insert, MICROBIOLOGY.) Eradication of H. pylori has been shown to reduce the risk of duodenal ulcer recurrence. Each teaspoonful (5 mL) will contain 200 mg amoxicillin (as the trihydrate). Each teaspoonful (5 mL) will contain 400 mg amoxicillin (as the trihydrate). 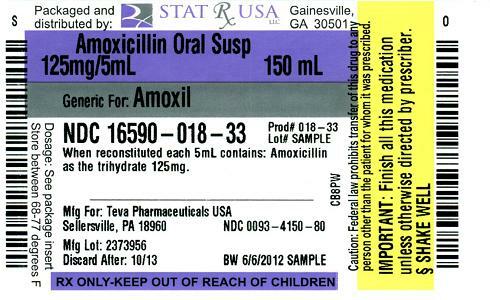 Amoxicillin capsules USP: hard gelatin capsules with a caramel cap and buff body, imprinted "TEVA" on the cap and “3107” on the body and contain 250 mg amoxicillin as the trihydrate; hard gelatin capsules with a buff cap and body, imprinted "TEVA" on the cap and “3109” on the body and contain 500 mg amoxicillin as the trihydrate. Mean amoxicillin pharmacokinetic parameters from an open, two-part, single-dose crossover bioequivalence study in 27 adults comparing 875 mg of amoxicillin with 875 mg of amoxicillin/clavulanate potassium showed that the 875 mg of amoxicillin tablet produces an AUC0-∞ of 35.4 ± 8.1 mcg•hr/mL and a Cmax of 13.8 ± 4.1 mcg/mL. Dosing was at the start of a light meal following an overnight fast. Metabolism and Excretion: The half-life of amoxicillin is 61.3 minutes. Approximately 60% of an orally administered dose of amoxicillin is excreted in the urine within 6 to 8 hours. Detectable serum levels are observed up to 8 hours after an orally administered dose of amoxicillin. Since most of the amoxicillin is excreted unchanged in the urine, its excretion can be delayed by concurrent administration of probenecid [ see DRUG INTERACTIONS (7.1)]. Amoxicillin has been shown to be active against most isolates of the bacteria listed below, both invitro and in clinical infections as described in the INDICATIONS AND USAGE section. This analysis was based on evaluable patients with confirmed duodenal ulcer (active or within 1 year) and H. pylori infection at baseline defined as at least 2 of 3 positive endoscopic tests from CLOtest, histology, and/or culture. Patients were included in the analysis if they completed the study. Additionally, if patients dropped out of the study due to an adverse event related to the study drug, they were included in the analysis as failures of therapy. 125 mg/5 mL available in bottles of 150 mL. 250 mg/5 mL available in bottles of 100 mL.